We all know that millions of people are experiencing extra stress. Much outgoing care and compassion is needed to help ease the emotional pain that so many are increasingly experiencing. 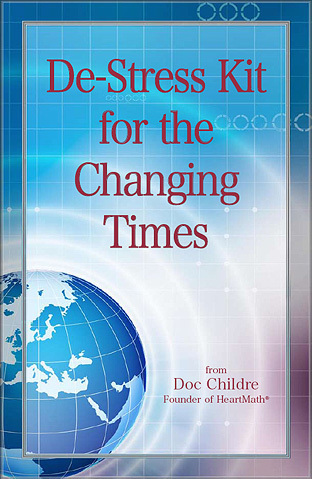 Doc Childre, founder of the HeartMath Institute, has written a free booklet De-Stress Kit for the Changing Times that provides a few simple practices to help people intercept and manage stress during this period of challenge and uncertainty. The De-Stress Kit for the Changing Times already has reached a great number of people, but the HeartMath Institute is being inundated with requests for print copies. Stress is increasing daily and there are so many people who don’t have access to computers who need the print version. These include people who visit social service agencies, welfare and employment offices, homeless shelters and tent cities, soup kitchens, community health clinics, retirement homes, military personnel at the battlefront, churches, juvenile detention centers and prisons. HeartMath would sincerely appreciate it if you could help by contributing $1 or more to help get printed copies of the De-Stress Kit to these organizations so they can distribute them to those in need. Donate Now.